Found another crush today...Hamilton Design and boy is their work yummy. I'm short on words today since it's Friday and all. I'm really just focused on that large glass of wine I'm going to have when I get home from work. OMG love that dining room! that one will be put into the inspiration file for sure! Love the kitchen and entry. Have a great weekend. Spectacular kitchen! Love the backsplash and pendant lights. I love them images!! The globe kitchen pendants are amazing. Have a great weekend! How can you not love that fabulous art!! Love the entry the best! Enjoy that wine tonight, I know I will. 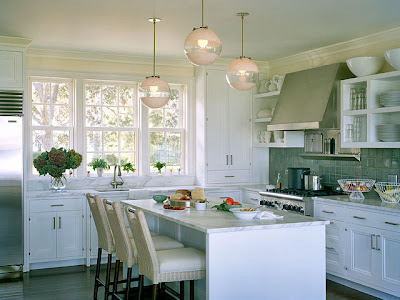 So pretty, love the kitchen! You had me at that red wall! Gorgeous! Stop by when you can for a giveaway. It's my biggest one yet. :) Have a good weekend! good call! I love, love, LOVE that kitchen. and those lights. oh man. happy friday! have a great weekend. Oh yeah, I can see why you have that crush! Adoring that fabulous pop of color in the entryway, first image!!! Makes me want to grab my paintbrush and get crazy with color this weekend...enjoy yours! Ooooh. I like. Clean nuetrals + good light + art. love the chairs. so wonderful! Love the artwork in the first pic!! 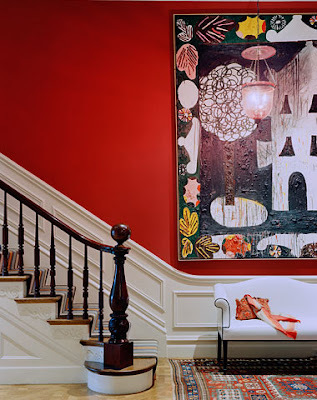 That first image is incredible -- love the red wall, the art and the bannister (I'm currently dying to redo my bannister so I'm always looking for inspiring pics to file away for when I get around to the project). Beautiful! I want to move right in to that second room. Thanks for the tip - heading over to find a website to see more! Love this! 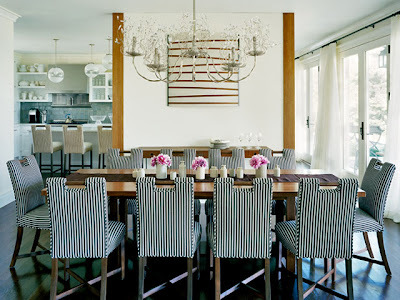 Those striped dining chairs are amazing! how was that glass of wine? love these images...that kitchen is awesome.